Primate social groups consist of a network of interactions that build upon dyadic relationships of their members. While traditionally these pairwise interactions have been the focus of much research on the structure and function of social behavior, characterizing the complex social experiences of individuals, or the pattern of interactions in an entire group, is not easily achieved through such measures. 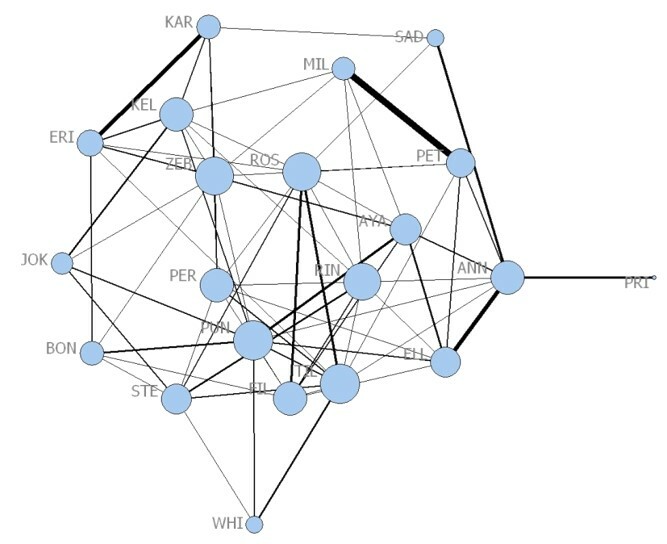 I am interested in exploring the use of Social Network Analysis (SNA) – a formalized set of tools for studying the connectivity among members of social units and their complex multidimensional structure – for understanding the adaptive value of behavioral strategies in primate groups. Based on existing evidence from humans and some non-human primates, social integration can be an important factor influencing health and reproduction. Using SNA, it is possible to take into account not just the number of partners, but also the distribution of interactions and the relative “importance” of each partner, i.e. their respective positions and influence. There are many open questions about what aspects of social structure are most relevant to individuals and under what social and ecological conditions, or what mechanisms are responsible for the evolution of these structures and their consequences on individual fitness. I address this topic with data on three different primate taxa: forest guenons (blue monkeys & Sykes’ monkeys), chacma baboons, and chimpanzees. A comparative approach across taxa may ultimately reveal new insights into the evolution of primate social structure that go beyond what we can learn from studying dyadic interactions.